John Muir is, without a doubt, the most influential VW nut in the world of VW nuts. 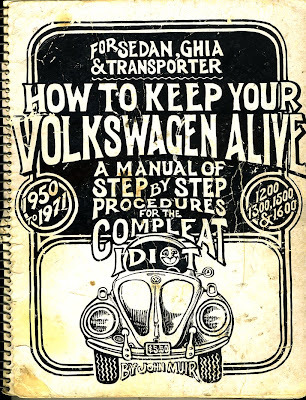 His 1969 book, How To Keep Your Volkswagen Alive (otherwise know as the "Idiot's Guide"), became the standard by which all “how-to”guides are now judged. It’s hard to find a VW owner who doesn't have a tattered old copy. On the Samba, the swirling online home of VW madness, it is often the most referenced resource, recommended to newbies and the bible to long-time aficionados and do-it-yourselfers. When Monty, the previous owner of Big Blue, our 1968 bus, bought the bus in 1970, the next thing he purchased was the Muir book saying, “The idiots guide to VW repair came out and with the help of a local hippy VW shop, I kept it running". The book, written in a style that’s part how-to, part philosophy, with a shot of apocalyptic views thrown in to keep you honest, inspired the disenfranchised generation of the 70s. After the hod rodders of the 50s were being corralled by new laws and stricter enforcement, people were increasingly distant from their automobiles. The counterculture of the late 60s wanted little to do with the mechanics of their vehicles. More than that, with increasing emission controls and complicated machinery coming out of Detroit, they were unable to work on their cars. Of course, the one car that bucked this trend was the VW sedan (the “bug”). For almost 48 years (72 years if you count production in Mexico), the design of the bug would change very little. With its easy to work on horizontally-opposed 4-cylinder engine, its lack of computerized anything, and its relatively lacking in extra electronics, the bug became the perfect, inexpensive car for the anti-car people. John Muir’s book took advantage of the lack of change on the part of Volkswagen and his style of writing took advantage of the counter culture that would embrace the VW lifestyle. Published by his own publishing company (which would only publish a few other titles while in existence), Muir took the VW owner from buying the car all the way through a complete engine rebuild. While other VW how-to books show fancy rodded out VWs on the front, or imposing shots of rebuilt high performance engines, Muir’s cover features illustration and the sub-title, “A manual of step-by-step procedures for the compleat idiot” (note: “Compleat, along with other spelling in the book, seems to give some insight into Muir’s own version of reality). Muir had an impressive resume (included in the book!) prior to getting involved in VWs and writing the now famous book. He was a schooled engineer, who apparently designed missiles for Lockheed in his early years. 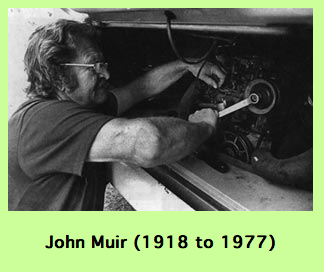 It seems a far cry from the hippie Muir would become when he settled down with his VWs. Setting up shop in sleepy and counter-culture leaning Sante Fe, New Mexico, Muir let his hair grow shaggy and sported a mustache (his advice often involves putting your hair up in a stocking cap). He worked on VWs and would visit other VW mechanics to see what and how they were doing things. In December of 1969, when he was 51-years old, he published the first edition of the book under the company name, John Muir Publications. The book was spiral bound for ease of opening it while working on your car. It went to a 2nd printing 3 months later, and by August 1970 they created a revised edition. The book is also famous for the illustrations by Peter Aschwanden. Aschwanden, who looks a little like Willie Nelson if Nelson lived the life of a desert explorer. Peter seems to have fit in well in the counter-culture of Santa Fe (although, he never owned a VW!) and illustrated in a style similar to - but not the same as - Stanley Mouse, Robert Crumb and other examples of late 60s illustrators. It is hard to imagine the book having been nearly the success it is without Peter’s input. His illustrations matched perfectly with the earthy-toned writing of Muir. And many a night of armchair VW fixing has been spent studying the drawing as much as Muir’s writing. The book may have been Muir’s brainchild, but it was Aschwanden’s work of art. While being a perhaps unsuspecting business man, Muir seems to have been good at it. According to their website, PeoplesGuide.com, Carl Franz & Lorena Havens met John and his wife Eve Muir in the early seventies, while camping in Mexico. Muir had a parrot named “Hey Man!” and a stack of his books in his VW bus. John gave them a copy. Even on vacations, Muir seemed to be a hippie salesman, although it may have been John was, to paraphrase my local VW mechanic, simply turning them on to the scene. He also sold t-shirts (T-shirtz) and posters featuring art from the book. And sold cassette tapes of engine noises. You could order them from the back of the book. In this section we are giving up the Right to Lie, but only the Right to tell 100% lies. The rest of the scale is your own business. While Muir’s novel is mentioned occasionally on VW forums, it is his “Idiot Guide” that he will always be remembered for. The book has over 2 million copies in print and there have been Spanish and German (of course) editions. Even though the book is now no longer spiral bound (the books were getting damaged in shipping, though there are instructions in the newer editions of the book for how to cut the spine of and have it bound in a 3-ring binder) it continues to sell almost 20,000 copies a year. That’s amazing considering that the last aircooled VW imported into the US was in 1983. While not all VW enthusiasts agree with his methods and some non-smokers grapple with his warming the car up instructions (which asks you to wait as long as it takes to roll your own cigarette and get it going really well), no one can deny the influence he had on the VW scene. When we bought our bus, the original copy Monty bought in 1970 was still in the back, though now moldy and grease-stained. And I use it almost every time I work on the bus. If for nothing else than to gain a little perspective on why I am working on the bus. Video of John Muir messing around. I very much enjoyed this education Big Blue's Driver. Well done. I have spent a few winter nights in the bus with a candle going studying Aschwanden's pictures. Never fully understood the internal combustion process until I got a copy of the book. 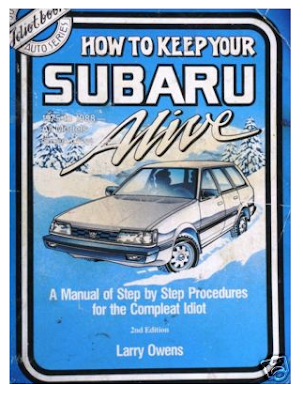 Muir's publications also included a book on the 1982-84 Subaru. A fabulous 4wd cult car. His publication work with Carl and Lorena gave us Camping in Mexico and Cooking On and Off the Road. Sadly out of print but worth the search. Despite a couple occasions of frightfully bad advice (e.g., 009 dizzies are j.u.n.k. no matter what the Rt Hon. Mr. Muir says), the importance of having and reading the Idiot Book when confronting one's first ACVW cannot be overstated. I don't know as I'd've had the moxie to try my hand at V-Dub ownership way back when without it. In 1972 with Muir's book and my first 1959 bus I learned to turn wrenches. I've been doing it since then. I have many a long conversation with Muir while working on my bus by the side of the road. It wasn't until many years later that I realized I was have a conversation with a dead man. A 'how to' book you can talk with, hard to beat that. I have a copy in the garage, I bought it last year. 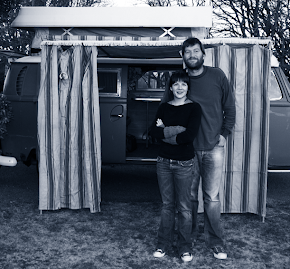 Great Blog and John Muir has kept many owners happy and VWs on the road. I owned a 1970 Beetle convertible from 1986 to about 1993. Keeping it alive was at first a necessity, and then an obsession! I still have my copy of Muir's book (complete with dings, grease stains and dog ears), and I think back to those late nights in the garage with fondness. I maintain that his book was a collection of Zen philosophy masquerading as a repair manual. harvq - If you can wade through it, The Velvet Monkey Wrench is a crazy philosophy book and worth examination. Though, you hit the nail on the head that his VW book may b more "Zen" than TVMW. I lived with John and Eve on a commune in Oregon in the '70's. John was an interesting fellow. He and I used to have deep discussions and arguments about the ideas in "The Velvet Monkeywrench" before he published it. Unknown - any chance you have photos from that time? I know that VW fans everywhere would love any insight into John's life. I fell in love with the beetle when my fiance bought one in 1969.The smell,the sound many things. When I came back from Vietnam and got married, we had it for a further 4 years before selling it.A few years later we got a 1966 model 1300. Finding John Muirs` book in the local library and reading it was a wonderful experience and although the VW is long gone I still read through his book to remember those times. Not the library book, but his spring bound edition I bought here in Australia. I bought a light-blue 1965 bug, with a crank moon roof, in 1971. With the help of John Muir's book I overhauled the engine in 1974. It took me about 6 weeks. I learned about cars, and I learned about life. I learned that I didn't have to buy a complete set of tools; I could just buy them as I needed them. I learned that you could approach car maintenance in one of two ways: preventative maintenance, or wait until something broke. Looking back, I know that the experience using that book gave me a lot of self-confidence. Through the book, John Muir filled in quite a few of the empty spots I had from my own dad not being around a lot. Thank you John Muir. 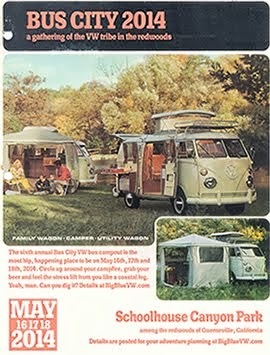 Addendum to my previous comment of June 24 2017: I think I originally ran across How to Keep Your Volkswagen Alive through the Whole Earth Catalog, a great resource for Do-It-Yourself information. Online repair manuals are now a days has become really popular. But which one to truest is the main fact. I have searched many things about that and found that Manuals.co is the best one available right now which is providing all sorts of car related facilities online from manuals to the services help.